The helmet Aaron wore when he rode his all-terrain vehicle (ATV) was supposed to keep him safe. But a hard crash caused his helmet to crack and sent a piece of it into the carotid artery in his neck. That wasn't the only damage. Aaron suffered a traumatic brain injury, stroke, hip fracture, and several skull fractures, including one near the spinal cord. "My prognosis wasn't good," Aaron said. "My left side was affected by the stroke. The doctors didn't expect me to be able to walk again, and predicted I would be mentally challenged." Aaron was in the hospital for almost 2 months after the accident. He had 3 brain surgeries in the first week, and surgery to repair his hip at 4 weeks. But that was just the beginning. Three months after the accident, Aaron entered a skilled nursing facility and had an additional brain surgery. He then spent 3 weeks at an intensive inpatient therapy hospital, where at the age of 25, Aaron learned to sit, stand, and walk again. "I was determined to recover," Aaron said. "I couldn't do any weight-bearing activity for 4 months, but slowly I began to improve. My physical therapists were all close to my age, and they knew how to motivate me to do my best." A year and a half later, Aaron was able to walk short distances with only the help of a quad cane. "I'm working on my endurance and stride," he said. "Every day I get stronger and I can walk a little farther. I would not be where I am today if it were not for my physical therapists." In addition to his rehab at the physical therapy clinic, Aaron puts in hard work at home. He and his mother have turned their garage into a space where he does 3-4 hours of physical therapy exercises every day. "My mom has been able to help me a lot in my recovery," Aaron said. "She's even thinking about becoming a physical therapy aide when I'm fully independent again." 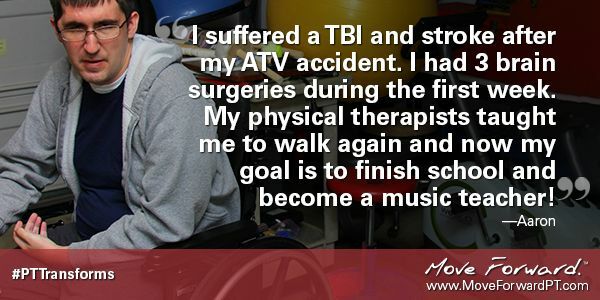 An audio engineer before his accident, Aaron looks forward to returning to doing what he enjoys. "Soon, I'll be volunteering in a school-based vocational rehabilitation program in a school's music department," he said. "My ultimate goal is to go back to school and finish my music degree and become a music teacher, a goal that is closer every day."